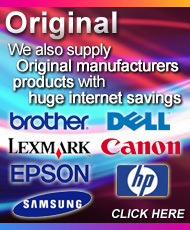 At UK Ink Supplies, we sell a variety of different ink cartridges and laser toners. An original or OEM (Original Equipment Manufacturer) ink or toner cartridge is the branded product of the printer manufacturer. Therefore, if you have a Canon printer, the original toner cartridge will be manufactured by Canon. As you would expect the printer manufacturer will always encourage consumers to buy their own branded product. We do supply a large range or original products, but recommend Jet Tec ink cartridges and laser toners for both quality and value for money. We supply Jet Tec compatible ink cartridges. Compatible cartridges are brand new cartridges supplied by an independent manufacturer. Compatible cartridges are manufactured to the same standards as original cartridges but are normally significantly cheaper. Any Compatible cartridges supplied to you by us are 100% guaranteed for a year. Furthermore, many Jet Tec compatible ink cartridges are designed to print up to 100% more than the Original ink cartridge! We supply Jet Tec and GreenTech remanufactured laser toners and ink cartridges. A remanufactured ink cartridge is a refilled original cartridge. Many printer manufacturers now encourage people to recycle ink cartridges and toner cartridges. These recycled cartridges are then remanufactured and refilled. Remanufactred Cartridges are cheaper and often contain a lot more ink than the originals. It is the environmentally friendlier solution that you can depend on to perform as well and last every bit as long as the original. The remanufacturing of toner and Inkjet cartridges has saved millions of cartridges from being dumped in refill sites, and brought cost savings to the consumers. 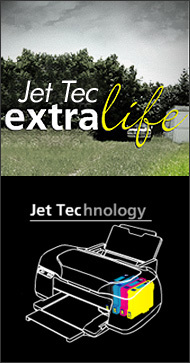 Jet Tec is Europe's leading manufacturer of compatible and recycled printer products. Jet Tec has been established for over 25 years at its UK manufacturing base and is renowned for the quality, reliability and patented technology of their products. 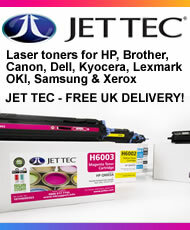 At UKInkSupplies.com we only stock products that we believe represent the best value and quality on the market, we have nearly a decade of experience selling Jet Tec products throughout Europe and firmly believe that switching to Jet Tec will change the way you think about printing. GreenTech have been collecting, recycling and remanufacturing inkjet and laser toner cartridges in the UK for over ten years and estimate to have saved the equivalent of five million litres of oil or 120 football pitches worth of waste printer cartridges. GreenTech International's modern re-manufacturing facilities are based in Peterborough, where a unique manufacturing service is provided. GreenTech is ISO 9001 Certified.